Suede Embroidered Ladies Passport Bag. Hand embroidered passport or sling bags. Crafted by local craftsman. These are two pocket bags. Comfortable for keeping important stuff while roaming. Due to our years of expertise in this realm, we are readily affianced in presenting an exceptional quality variety of Handicrafts Bags. Mirage Fashion Pvt . Ltd. Designer Pass Port Bag with fully lined with soft reinforced flannel. 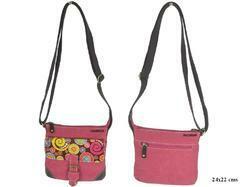 The Leather for this bag is moulded with special equipment to give permanent shape & size. Matching up with the exact demands of our patrons, we are highly engaged in offering a superb quality collection of NS Ladies Passport Bag. 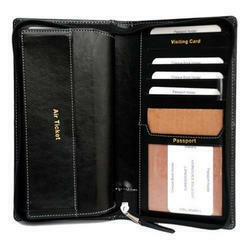 We are engaged in offering high quality Passport Bags to our customer.